HASBROUCK HEIGHTS, NJ – January 9, 2018 -The Foundation for Chiropractic Progress (F4CP), a leading voice in the chiropractic profession, points to an analysis of a national survey recently published in the journal, SPINE. This analysis examines the prevalence, patterns and predictors of chiropractic utilization in the U.S. general population, and reports a substantial proportion of U.S. adults utilized chiropractic services with positive outcomes for overall well-being and/or specific health problems. 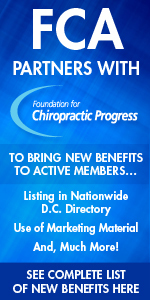 · There is a growing trend of chiropractic use among U.S. adults from 2002 to 2012. · Back pain (63 percent) and neck pain (30.2 percent) were the most prevalent health problems for chiropractic consultations. · The majority of users reported chiropractic helping a great deal with their health problem and improving overall health or well-being. The 2012 NHIS survey it the most recent source providing data on the use of complementary health care approaches by adults in the United States. A not-for-profit organization, Foundation for Chiropractic Education (501-(C)(3)) and the Foundation for Chiropractic Progress (501C6) provide information and education regarding the value of chiropractic care and its role in drug-free pain management. Visit www.f4cp.com; call 866-901-F4CP (3427). Social media: Facebook, Twitter, LinkedIn, Pinterest, YouTube.